Eagle County, Colorado, home to Vail and Beaver Creek ski areas, is getting a reputation as a high-country incubator of somewhat unconventional politicians seeking higher state and federal offices. The most recent examples are former Eagle County Commissioner Arn Menconi on the left and former Vail Town Councilman Mike Cacioppo on the right. 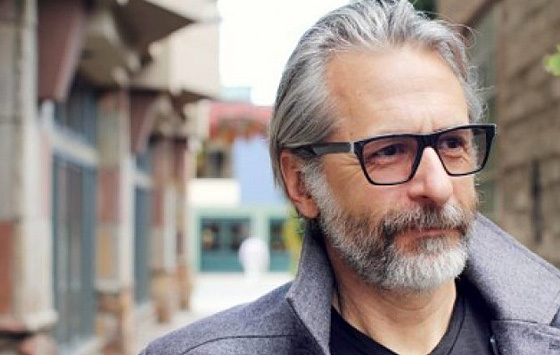 Menconi is currently running as the Green Party candidate seeking to dethrone incumbent Democratic U.S. Sen. Michael Bennet. He dismisses any spoiler role the Green Party may play in the current election cycle, instead insisting on his third-party legitimacy while joining a guy in a bunny suit to disrupt the most recent senatorial debate in Denver (see Colorado Independent story below). Cacioppo is a Republican seeking to dethrone incumbent Democratic state Rep. Diane Mitsch Bush of Steamboat Springs for her State House District 26 seat. He has been criticized in the past for publishing a political newspaper without putting his name on it (instead referring to himself as “Ye Olde Publisher”}, and now he’s the subject of an official campaign finance complaint with the Colorado Secretary of State for allegedly failing to report content in his own paper as campaign expenses and contributions. “Silly season has begun, as I predicted it would, closer to the election,” Cacioppo told the Steamboat Pilot & Today newspaper. Cacioppo has the full backing of the Eagle County Republican Party led by Kaye Ferry, a former Colorado Board of Education candidate and chamber of commerce official who rather infamously called Denver skiers “riff-raff” in 2008. DENVER — Flanked by a throng of city cops, more than a dozen Green Party activists loudly disrupted the only live televised U.S. Senate debate between Michael Bennet and Darryl Glenn, pounding on the glass walls of a downtown state museum and chanting “open the debate” so loudly the moderators had to address it. Inside the Anschutz Hamilton Hall on the first floor of the History Colorado Center, incumbent Democrat Bennet and Republican Glenn faced off in their second— and final— head-to-head debate in the U.S. Senate race. 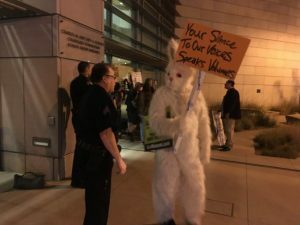 Outside, led by Green Party U.S. Senate nominee Arn Menconi and a man in a white bunny suit, the activists pounded on the museum’s large glass doors and walls, and chanted so loudly it became hard for audience members to hear the two candidates speaking from their podiums inside. About 10 minutes in, the demonstration forced the debate’s moderators, 9News anchor Kyle Clark and political reporter Brandon Rittiman, to acknowledge it live on the air. Following a portion of the debate about Glenn’s opposition to President Barack Obama’s Trans-Pacific Partnership global trade agreement, Clark paused to face the camera. Clark said 9News, Denver’s local NBC affiliate, uses a 10 percent threshold from two polls of the station’s choosing to decide who gets to participate in their debates. “Some folks are exercising free speech outside by using the building as a bass drum,” Clark said. At one point, the chanting and glass-pounding grew so loud that Glenn asked a moderator to repeat a question. Frustrated, museum security asked local police to intervene. But there was a twist: The museum is state property, which officers interpreted as being outside the jurisdiction of the city’s cops. As protesters slammed on the glass and waved signs like “Your silence to our voices speaks volumes,” Denver Police Sergeant J. Lucero said officers were trying to figure out whether they could make arrests or would need to call in state authorities. At one point, Lucero pulled Menconi aside to explain the situation, saying he was a firm believer in the First Amendment and showing Menconi which part of the surrounding area was state owned and city owned. John Vegil, 54, a local cannabis worker, veteran and a registered Democrat, said he heard about the demonstration on social media and decided to join. Green Party member Susan Hall, a teacher, said she took part in the protest in hopes that it might change the mind of a voter who noticed. “It’s not right to shut out people,” she said. There are about 13,000 registered Green Party members in Colorado. For comparison, there are about 40,000 registered Libertarians. Other non-major party names on this year’s U.S. Senate ballot include Libertarian Lily Tang Williams, Unity Party candidate Bill Hammons and unaffiliated candidates Paul Fiorino and Dan Chapin. 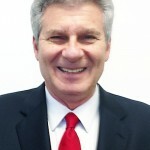 Write-in candidate Don Willoughby is also running. You can watch a recent debate in Pueblo among Menconi, Fiorino, Chapin and Willoughby here. Outside the museum, the man in the bunny costume, who did not give his name, said in his experience passersby will stop and read a sign if it is carried by a rabbit.